Selection. Wegmans offers vast amounts of food, drinks, and household items, but more than quantity, it’s the quality and variety of Wegmans’ selection that make it one of the best. Shoppers can find organic and specialty foods, plus international foods, divided by regions and an expansive selection of cheeses, produce, beer and wine, baked goods, candy, and customized cuts of fresh meat. Subs. With the amount of press Wegmans subs receive, it would be remiss not to include it in this list of secrets to success. Wegmans’ pizza, too, is highly regarded, and the demand for both reflect a new trend of grocers with restaurant elements positioning themselves in competition with restaurants. According to USA Today, grocers like Wegmans are extensions of the traditional grocery counter delis transformed into upscale dining experiences. In 2016, they also generated more than 2.4 billion visits and $10 million in sales. Dining. More than 40% of Americans buy freshly prepared foods from grocery stores, reports NPD Group. At Wegmans Market Cafe, shoppers can enjoy freshly prepared food and drinks in a clean, cozy atmosphere, with some stores providing outdoor seating, a children’s area, a fireplace, and a quaint sports bar section. The prepared foods at any given Wegmans might include Asian cuisine and sushi, Mexican food, homestyle comfort food, soups, salads, and more. Private label value. Similar to Whole Foods and Trader Joe’s (both highly rated among consumers as well), Wegmans’ private label products are high quality and value priced. Staff. For 20 years, Fortune Magazine has ranked Wegmans among the Top 100 Companies To Work For, and in 2017, Wegmans ranked #2. Happy employees make for excellent customer service, attests a Forbes article entitled, Happy Employees Equals Happy Customers. Ready-to-cook meals. Prepared fresh and complete with meats, veggies, and seasonings, packaged meals appeal to today’s shopper looking for convenience without compromising nutrition. Wegmans’ packaged meals range from pot roast vegetables to lemon chicken and zoodles. Cleanliness. 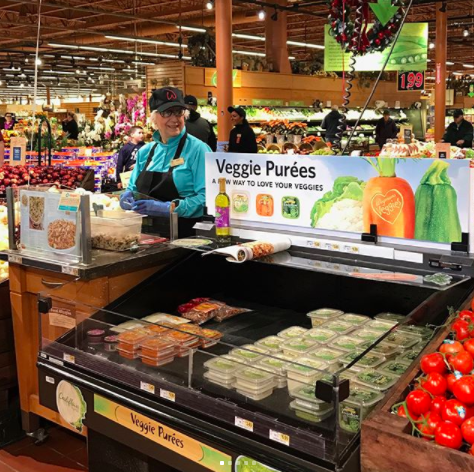 Customers desire to buy their food from clean stores, but Wegmans’ cleanliness stands out above the rest, known for its wide aisles, perfect displays, clean floors, and well-lighted areas, reports Business Insider.